French black metallers Véhémence will release their second full-length album entitled “Par le Sang Versé” on February 2nd, 2019 via Antiq Label. Epic medieval black metal with fascinating riffs, the new Véhémence album is an immersive and blazing experience. 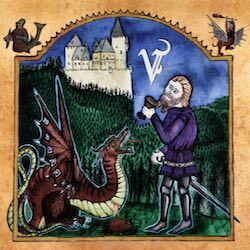 Hold by lyrics with fantastic themes inspired from chivalry sagas, this one-hour disc is a journey in a medieval-fantastic universe. Véhémence brings here a model of composition and execution. “Par le Sang Versé” will be available in 2 different versions: a regular digipak edition CD with 16-pages booklet and a special edition strictly limited to 100 copies, containing the regular digipak album with the 16-pages booklet, an exclusive gold thread embroidery patch and a signed and hand-numbered card representing the band members, Tulzcha and Hyvermor, all in a gold hotfoil luxurious black and gold A5 DVD box. Both versions are available for pre-order in their label’s web-shop.